Macrophage eating Leishmania. 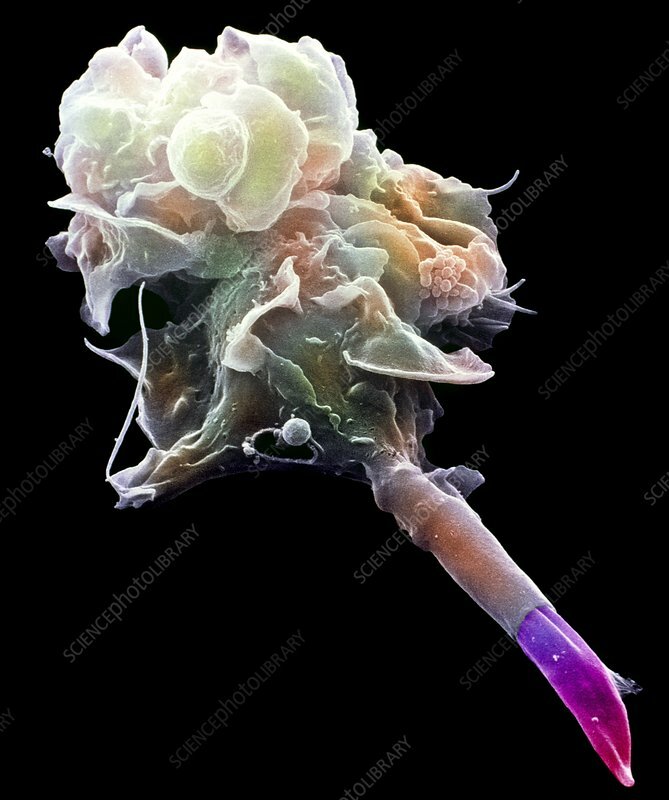 Coloured scanning electron micrograph (SEM) of a macrophage engulfing a Leishmania sp. parasite (mauve). Leishmania is a parasitic protozoan that causes the tropical disease leishmaniasis. Here, the macrophage, a type of white blood cell, has extended part of its body (brown/white) to capture the Leishmania. This process is called phagocytosis. Leishmaniasis is transmitted to humans by bites of infected sandflies, causing a skin ulcer at the site of the bite. Macrophages are part of the immune system and keep the body free of invading organisms. Magnification: x1,950 at 6x7cm size.